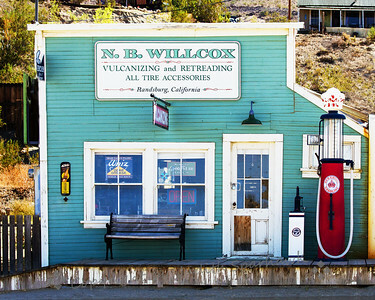 Photographs from trips to Randsburg, California, a small old mining town on Highway 395. Driving up Highway 395 in eastern California, not long before getting to the east side of the Sierras, it is mostly dry desert hillsides with the mountains in the distance. This was. 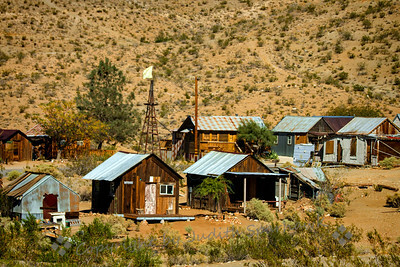 and still is, mining country, with small old mining communities remaining. 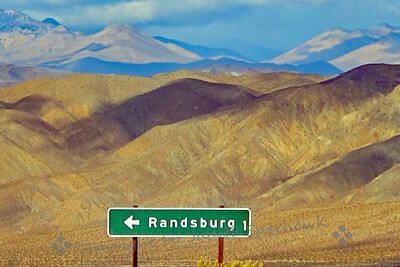 One of those is Randsburg, one mile off the highway. It is a small old town, one that has become a popular tourist stop (even buses of Japanese tourists have visited there, I understand). I visited there today, hoping to see a certain bird (no luck) but had fun wandering with my camera. It was cold and windy, so some of it was shooting from the car. 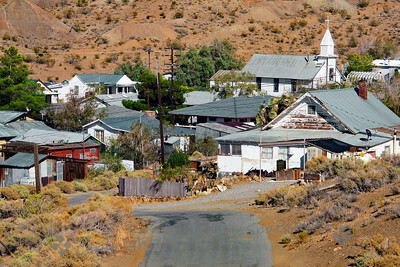 An overview of part of the town of Randsburg, showing small rustic houses. One view of town from up a hill. There are a few paved roads that wind around in and out of town. 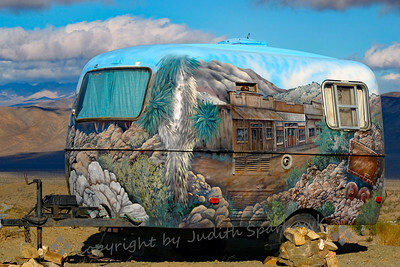 Randsburg, CA. 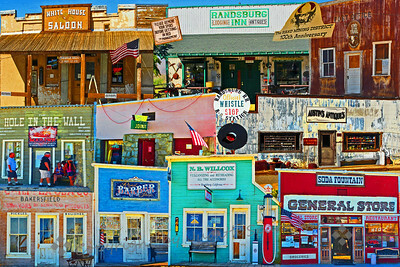 Randsburg has quite a few nostalgic touches reflected in its "downtown" area. Downtown is really one street about 3 blocks long. 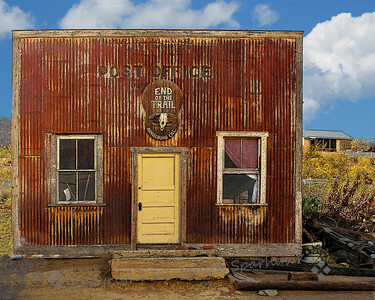 Note the US Post Office sign on the side. 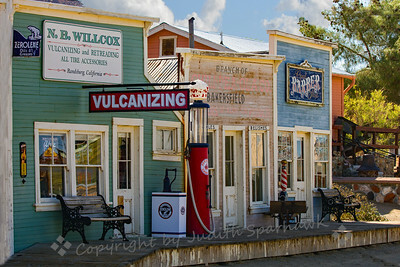 One of the businesses on the main street in Randsburg, CA. The shops are on a raised sidewalk above street level. 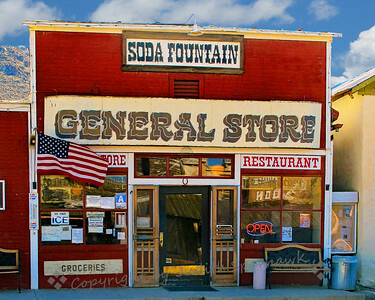 This cute little general store is on the main street, and acts as a restaurant, grocery store and a soda fountain. 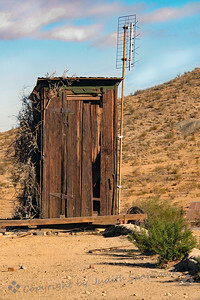 Randsburg, CA. 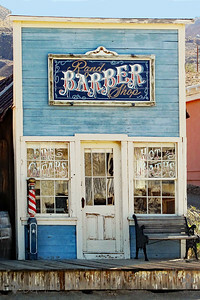 One of the cute little businesses along the main street of Randsburg, CA. 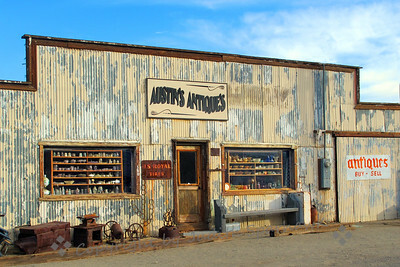 One of several Randsburg antique shops. You never know what you will find here. This is the name on the door window of this shop. Not sure what it means, but it appears to be yet another Randburg antique shop. 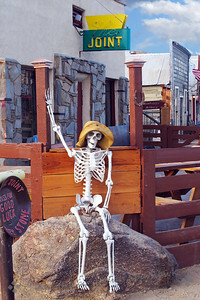 I don't know if it was left over from Halloween, but there were several skeletons around town in Randsburg. This one was sitting outside The Joint, the local "watering hole." The Inn and a little bit of everything you could want or need! 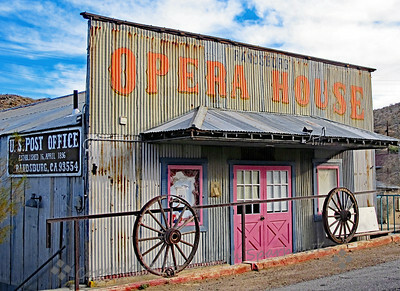 Randsburg, CA. 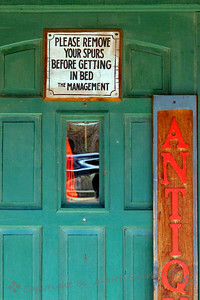 Just for fun, this sign was on the door of Randsburg Inn. I couldn't resist. 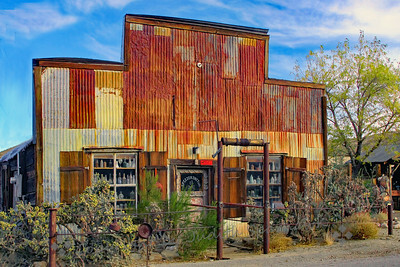 Another interesting little building in Randsburg, CA. 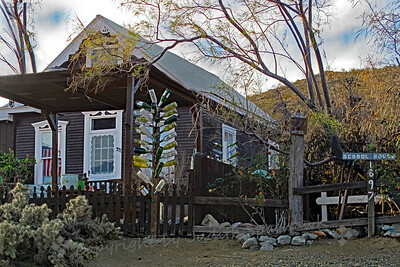 This house seems to be a private residence now, but the sign suggests that this building was the Randsburg School House at one time. There are quite a few bottle trees around town. 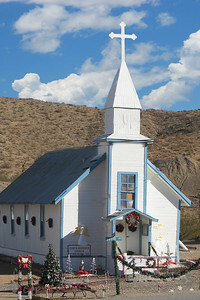 This is Santa Barbara Catholic Church in Randsburg, CA. It was all decked out for Christmas for my visit today, 11/27/17. 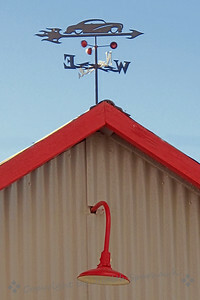 This weathervane was topping the motorworks business where the coyote and roadrunner art pieces were. 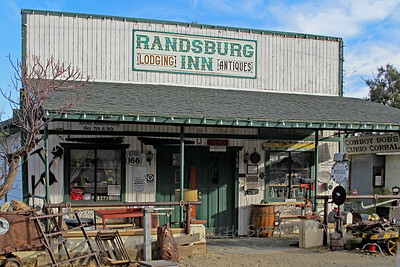 Randsburg, CA. 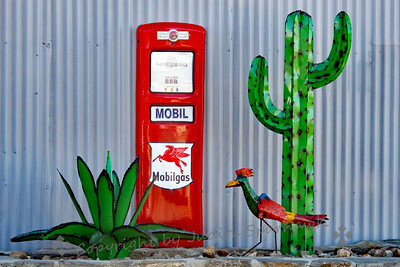 This art installation, along with the roadrunner, are in front of a motorworks business in Randsburg, CA. I had never seen the art here before--it was quite colorful and eye-catching. 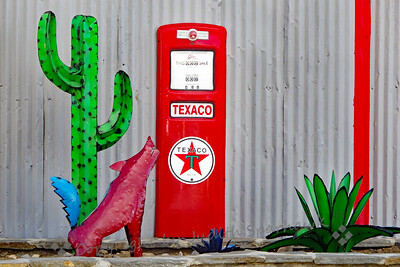 This art installation, accompanying the coyote piece, are decorating the outside of a motorworks business in Randsburg, CA. 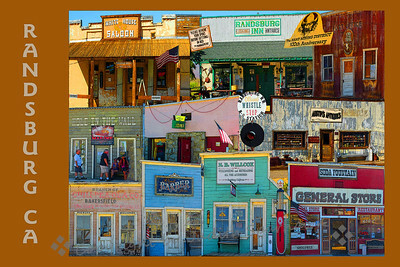 A collage created from photos taken in Randsburg, CA. Quite a bit of artistic license was used in creating this piece. Still, it was fun combining images to create a whole. It's not everyday you get to build a whole town. A version of the collage showing the town's name, perhaps to be used as a post card.